Inoxpa are market leaders in the hygienic sector, manufacturing stainless steel pumps, valves, filters, sight glasses, agitators and blenders from their factory in Banyoles, Spain since 1972. With a turnover of more than €49m in 2014 and over 530 staff, Inoxpa have shown continuous growth thanks to its investment in R&D and emerging markets. BM Engineering’s partnership with Inoxpa means that we are able to cater for many industries which require a hygienic application, such as the food and drink, pharmaceutical, dairy and cosmetic sectors. BME holds stock of ball, check and butterfly valves with either weld or RJT Male ends that are suitable for hygienic use. 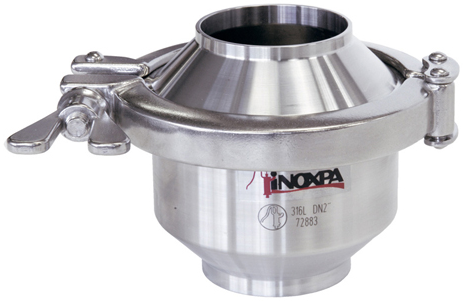 We are able to supply Inoxpa’s full product range, which includes various filters such as Y-strainers, angular and straight filters; ball, butterfly, non-return, diaphragm, single seat, mixproof and safety valves as well as sight glasses, pumps, mixing equipment and skids for CIP. Easy assembly/disassembly with the clamp.